Babys Breath is also known as gypsophilia. Our white and dyed varieties are used as filler in flower centerpieces, rose bouquets, bridal bouquets, and many other floral arrangements. It appears bushy with small flowers on stems that are long and slender. Originally it was discovered in Europe but is now grown in Colombia and Ecuador. If you want accentuate flower vases, try mixing it in. If you want to accent your Christmas décor, try using it dry as well, this is also good for craft and wreath projects. This product is available year around. 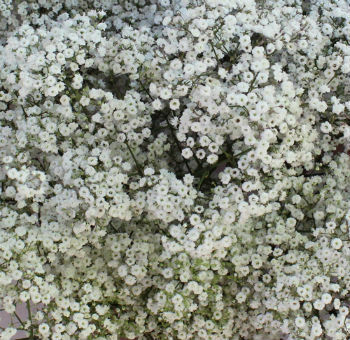 Baby's breath is a tremendously visual and delicate variety of flowers that can be used so many ways. Understanding more about them and their several uses can be both rewarding and beneficial when preparing for a wedding or event. 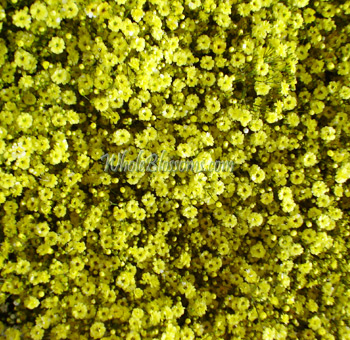 It is excellent choice filler for bouquets and centerpieces. 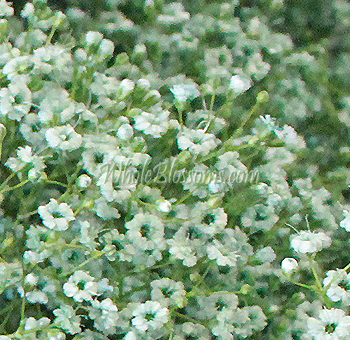 This particular variety is also called, gypsophila flower, and a million stars. 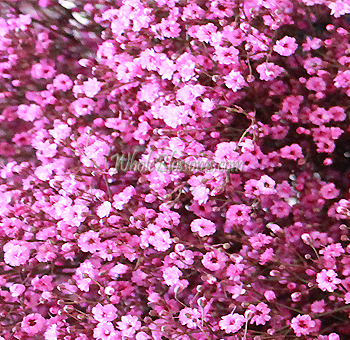 It has a look that resembles tiny cloud like blooms. It's a flower that comes from the carnation family. 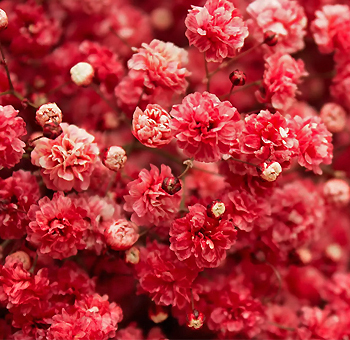 It's an ornamental flower that is traditionally used at weddings and receptions. If you have a wedding and plan on using this variety you may consider using it in pew arrangements, Mason jar arrangements, flower crowns, bouquets, bad vases, boutonnieres, corsages, wedding arches, table centerpieces, and so much more. 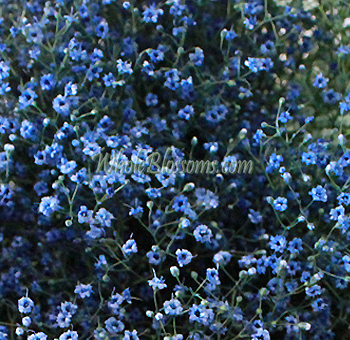 The first question you may need to ask yourself is, "how much will I need to make a Baby's Breath Bouquet or centerpiece?" The answer can vary and a lot determines on what kind of wedding or event you are planning and how big of an area will you be using. This decision will help you decide which Mason jar centerpieces will work to greatly enhance the imagery of the mind. Not only are centerpieces a beautiful creation, but a Baby's Breath Wedding Bouquet will look amazing with the right amount. Just think about this when preparing your Wedding Flowers: a single bunch has around 8-13 stems and are bundled together in bunches which means they are usually put together by weight, not necessarily stems. How many stems do I need for a centerpiece? 1/2 bunch for small, 1/2 - 1 bunches for medium, 1-1 1/2 for large. If you are filling mason jars, you will need ¼ bunch for small, 1/3 bunch for medium, and 1/2 bunch for large. If you are making a Bridal Bouquet you will need 1/4 bunch for small, 1/2 bunch for medium, and 3/4 - 1 bunch for large. This makes an excellent flower girl basket. Once you have your basket you will first need to add greenery. Put a small amount of floral adhesive around the edge of the basket and add small sprigs of plumose all around the outer edge. Next, Add baby's breath by cutting it into small pieces from the stems and place individual stems with adhesive around the basket, randomly mixing with the plumose. Next, add cut sweetheart rose buds from the stem. Put adhesive on the base of each rose and place them evenly around the basket, mixing them with the baby's breath and plumose. Depending on the size of your basket, you may want to use extra roses for fullness and color. Then, make twist ties. To make them, wrap floral wire with white floral tape. To wrap the wire, start at one end, hold the end of the tape with one hand and smooth down with the other hand. Cover the entire wire evenly. Make two twist ties. Lastly, attach bows. Make two double loop bows. Secure a bow to either side of the basket with twist ties. Attach the bows at the base of each handle by wrapping the twist tie through the bow, around the handle and back to the front. Twist the wire under the bow so it will be secure and hidden. Fill the basket with rose petals or potpourri. Begin by twisting two chenille stems together to form the halo. Measure the flower girl's head and form the halo to that measurement. Be careful not to make the halo too large so it won't slide down the flower girl's forehead. Next, you'll need to wrap short lengths of (about 12 inches) white floral tape around the halo. Remember to hold the halo with one hand and pull the tape with the other. Continue to wrap the tape around the halo until it's completely covered. Cut small stems of baby's breath and dip each individual stem into the tacky floral adhesive you have put into a small dish. Press each stem onto the halo and hold for a moment. 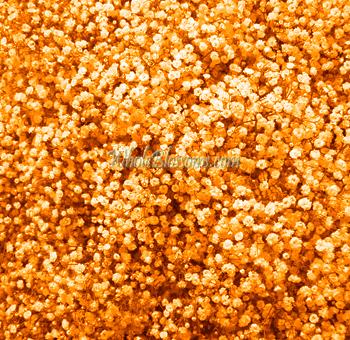 Continue adding flowers around the chenille halo form until you achieve the desired fullness. Be sure to use a very small amount of glue on each stem for best results. Next, cut eight sweetheart rose buds from the stems, leaving only the flower head. Dip individual rose buds in the adhesive and glue them to the chenille halo form among the baby's breath. Place the roses evenly around the halo. Now, attach the bow to the halo using a twisty tie. Twist the wire under the bow and cut the ends with wire cutters. Cut the streamers into desired length. Finally, store and maintain. The rose halo basket can be made up to three days in advance of the wedding if kept refrigerated. Attach the bows on the day of the wedding if the halo basket will be stored in the refrigerator. You can make this wedding project one day in advance of the wedding if its kept in a cool, dry place away from sunlight, light a garage or basement. Remember, the larger basket, the more flower petals you will need to be sure never to run out before reaching the altar. Also, be sure to check with your ceremony site to ask its policy on tossing flower petals on the floor. The local markets may seem like the right solution at first, but the problem is the freshness and quality you are looking for. 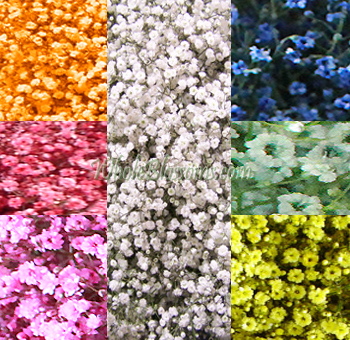 With Whole Blossoms, you are getting Fresh Baby's Breath Wholesale. You will be so glad you ordered from our website because of money saved, convenience, and fresh, premium quality. We have hundreds of satisfied clients every year who usually agree that buying wholesale was the best way to go.